Prints by the English landscape painter and watercolorist Joseph Mallord William Turner (1775–1851) reflect what many celebrated as his “truth to nature.” Turner’s art influenced several nineteenth-century American painters, Winslow Homer among them, and how they depicted the natural world. Turning to Turner features a selection of the master’s prints, including rare selections from his Liber Studiorum and Turner Gallery series, alongside prints by Homer and other artists who were inspired by Turner’s style. 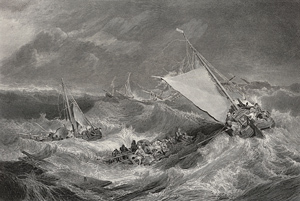 Image: William Miller, After Joseph Mallord William Turner, The Shipwreck. From J. M. W. Turner and W. Cosmo Monkhouse, The Turner Gallery (New York: D. Appleton & Co., 1879–80). Milwaukee Art Museum Research Center. Photo by John R. Glembin.